On November 18, 1993, at the height of their popularity, rock band Nirvana recorded their live acoustic performance at Sony Music Studios in New York City, just a few months after their third and final studio album “In Utero” topped the charts. The iconic album turns 25 this week. 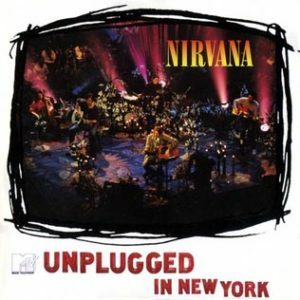 Released months after the death of the band’s front-man Kurt Cobain, “MTV Unplugged in New York” was to become one of the most acclaimed in the band’s discography, and has been hailed as one of the best live albums of all time. With its stripped down set and acoustic format, the MTV performance is a contradiction to the band’s grunge image and usual blistering alternative tracks, both surprising and frustrating many who had expected them to play their hits with blaring guitars that day. But in light of Cobain’s passing, the unplugged recording perfectly captured that moment in the band’s timeline. In retrospect, the solemnness was unsettling as it somehow foretold the tragedy that was to come the following year. The crystal chandelier and black candles on the stage certainly contributed. Stylistically, there also emerged a different side to the band which greatly contributed to their legacy: not only did it encapsulate Cobain at his artistic peak but also his most vulnerable and intimate that was not often seen in his performances throughout the band’s career. Apart from “All Apologies” and “Come As You Are,” the album comprise of a combination of the band’s lesser known tracks and covers of songs by David Bowie, Lead Belly, Vaselines and Meat Puppets. But the album was timeless precisely for those reason. True enough, the album debuted at number one on the Billboard album charts and was later certified 5x platinum in the US. Critics were equally impressed and praised the album, eventually winning the Grammy in 2006 for Best Alternative Music Album.